Closet, a fantastic NZ band tee maker, roped in some very willing NZ artists and designers to do a charity design for aid to Haiti. All profits are going to Oxfam's Haiti appeal... and since almost every step (advertising, postage, labour) has been donated, the profit % is huge. 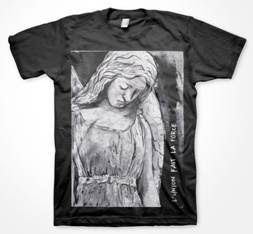 This is my Angel design (below). The tees are about $20 NZ, so are a bit of a bargain for any tee... think of it as a small donation with a wearable cotton thank-you note.